Southeast Alaska has seen economic growth in the last five years but that growth could soon be stalled by state budget cuts. 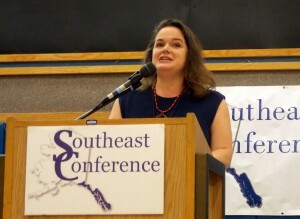 That was the message being shared at the Southeast Conference going on in Petersburg this week. By nearly all accounts, Southeast Alaska has seen growth in recent years. An annual economic report shows people coming to the region in droves. In the last five years, the population has grown by four percent, jobs have grown by four percent, job earnings have increased by 16 percent and passenger arrivals by plane, ferry and cruise ships has increased by 15 percent. Meilani Schijvens is with Rain Coast Data. “But all of that doesn’t mean anything with the fiscal contraction of the state budget,” Schijvens said. Schijvens was presenting the information to a few hundred attendees at the Southeast Conference. According to the annual report, “if it wasn’t for the state government’s impending fiscal meltdown, the region would be well positioned for a prosperous future”. Over the last five years, Southeast has added over 2,700 people and 2,000 jobs. Government makes up the more than a third of the jobs. The seafood industry employs 12 percent followed by tourism at nine percent. But state jobs in the region are expected to decrease by 200 positions in the first half of 2017. 500 other state jobs were lost in Southeast over last two years. Lt. Governor Byron Mallott is the keynote speaker at the Southeast Conference. He and the administration have long been touting the need for a state fiscal plan to address much lower oil revenue. “I think it’s important for all of us to realize at this point it is a self-inflicted storm,” Mallott said. Mallott blamed the Legislature for not putting a fiscal plan in place amidst a multi-billion dollar budget deficit. He said we don’t just need different revenue sources but a different core economy. And he believes local communities will continue to be hit. “We are essentially visiting the result upon local government because these services have to be met and if the state doesn’t do them in many respects core services will be demanded by local citizens of their local governments,” Mallott said. Mallot is optimistic though that law makers will find solutions in the 2017 session. Meanwhile, tourism in Southeast has been growing. Last year, the region broke the record for number of people arriving by airplane. But Schijvens said a reduction in the state’s tourism marketing budget could impact the industry. It was $18 million in 2015 but it’s been whittled down to $1.5 million for this fiscal year. One silver lining in government job loss is the U.S. Coast Guard. Southeast Alaska is home to 34 communities and more than 1,000 islands. The geography makes travel challenging and often happens on the water by boats, ferries and cruise ships. To help keep the area safe, the Coast Guard employs nearly 800 people in the region, a work force that’s increased by 26 percent in the last five years. Those federal jobs should be safe, said Schijvens. “Expect to see all sectors of government continue to shed jobs with the exception of the Coast Guard,” she said. Despite its remote nature Southeast is a good place to live if you’re older, according to statistics. Most of the population growth has come from an increased number of seniors. In the last five years, people ages 65 to 80 has increased by 42 percent. “The average age in Southeast Alaska is five years older than the state as a whole,” Schijvens said. The State’s Department of Labor predicts that one third of Southeast’s population will be over the age of 60 in the next few years. Overall, the Southeast region represents 10 percent of the state’s economy. The Southeast Conference continues in Petersburg through Thursday. Previous articleHomer Electric wants more control, is that best for consumers?